What does a perfect blog post look like? In this post I paint a picture and show and explain the eight elements of the perfect post, so it’s easy for bloggers to visualize. I recently curated an article on the perfect blog post by Kevan Lee of Buffer. It was chock full of great tips and best practices for blog posts proven by research, but some of my followers commented that the long and detailed article was hard to put into action. Some of the elements of the perfect post were new ideas for me (short lines of text at post beginning and shareable snippets called out!) and I highlight those in this post. I also have added some essential elements of my own, such as the call-to-action at the end. Some of the recommendations in the article I didn’t agree with (such as blog post length), so I’ve commented on these in my post. So, scan my blog post to capture the key elements of the perfect blog post, and then definitely take a look at Kevan Lee’s article on Buffer to get many more research study details that support these recommendations. The first element of the perfect post is the headline. The ideal headline has six words and is no more than 60 characters in length. The headline should be catchy and include a keyword or phrase that helps people who are searching for solutions and information on a specific topic find your post. Landing on a page that only contains text is not very appealing. You can add color and interest with great graphics. Including a key image at the top makes the blog post more attractive and ensures that when you share the post on social media such as LinkedIn and Facebook, there is a great thumbnail image that makes the link to your post stand out. This surprised me! The reason the image should be left- or right-justified surprised me. Studies have shown that it is easier for readers to begin reading when the lines of text are shortened. So, if you position the image to the left or right, the first few lines of text are shortened, making it easier for readers. Because most of my posts have a image that spans my full blog column, I was relieved when Kevan Lee suggests another way to provide shortened lines of initial text: bump up the font in the first paragraph of your blog post. Studies have shown that storytelling increases time spent on the blog post and the popularity of the post. Reading about the author’s experiences and how they led the author to his or her opinion on a topic is much more interesting that a dry dissertation on a subject. Sub-headers in the blog or a list help the reader scan the blog more easily. Not everyone is a reader, and if they are they don’t have much time. Kevan Lee’s article references a study that found readers only read 28% of the words in a post. Make your blog easy to scan with headlines, and use the headline hierarchy (for example H1 for titles, H2 for subtitles, H3 for highlighting points, H4 for information about the blog) that is common on websites to show the reader what is most important, etc. I know from personal experience if I land on a page and only see four paragraphs, I’m less than impressed. I haven’t analyzed the length of my posts, but I would say most are between 500 and 800 words. According to research, they should be longer! A study by Quick Sprout shows that blog posts with at least 1,500 words get the most shares. 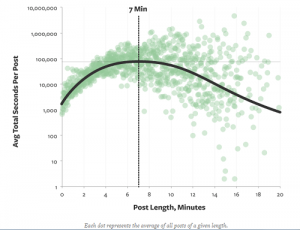 Yet another research study by Medium shows that the optimal length of time for reader engagement is seven minutes, which equates to 1,600 words, according to Lee. My personal opinion is that a post that is 1,500 is longer than I want to write and most of my readers want to read, but I definitely respect the research that has been done on this! By the way, this post has 969 words. What do you think – is it long enough? This is another surprise for me. I hadn’t thought of calling out snippets to make readers (who apparently aren’t really reading after all) more likely to share. This is a cool idea, because you could even watch the initial tweets when a post is published and then go back and call out those particular points. Lee references a post by Derek Halpern on this that is a tad technical, so if you’re like me you’ll be relieved that Lee also includes mention of a WordPress plugin called Click to Tweet that will accomplish this. A great blog post will leave your readers (scanners?) wanting more. So, I recommend adding a “non-salesy,” factual call-to-action with a phone number and link to a contact form. The call-to-action can be as simple as an invitation to comment on the post itself or to contact the author or company for more information. 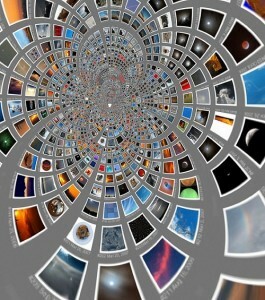 Do you get the picture of the perfect blog post? I tried to emulate most of the points on this page. Please let me know what you think! Do you need help with blogging? Do you need help writing the perfect blog posts? Do you need a blogging strategy, plan and a place from which to blog? Contact us at New Incite. We’ve been successfully blogging since 2009 and have helped several businesses get started on this important tactic. Photo by fdecomite on Flickr. Some Rights Reserved.